Reinstating Soil As Alberta’s First Natural Resource – Holistic Management Canada Empowering farmers and ranchers to make socially, ecologically and financially sound decisions in order to reach family and business goals. By Blake Hall, Holistic Management practitioner. Posted with permission from the Young Agrarians blog. Blake Hall is herdsman for Prairie Gold Pastured Meats and runs a unique herdshare program which direct markets grass-finished beef and pastured pork into Red Deer and Calgary, AB. Blake recently attended the National Farm Union‘s Youth Retreat in Nanoose Bay on Vancouver Island (BC) where he rocked out with us at the Young Agrarians Vancouver Island Mixer and we lassoed him into blogging. The short grass prairie on the eastern slopes of the Rocky Mountain Range is Alberta’s first natural resource. The great plains supported vast numbers of bison and sustained the First Nations for millennia. Sixty years prior to Leduc No. 1 striking oil, pioneers flocked to Alberta to establish large spreads, amazed at the ease with which their cattle would fatten and thrive. The highly mineralized soils grew grass that made these critter’s bodies shake with meat. It is the soil of this high prairie that first gave Alberta’s beef a far-reaching reputation. The historical reputation for Alberta beef has been co-opted and marketed in order to support an industry that has vertically integrated in this province but has lost sight of the true quality Alberta’s beef once possessed when it was entirely forage based and reflected our unique terroir. I am a native of Red Deer, Alberta where I grew up in town, the son of a school teacher. Out of high school I tumbled down the slippery slope into agriculture. Horticulture was the gateway but ultimately I built my skill set around Holistic Management, low stress livestock handling and grass-finishing of beef cattle. In 2010 I bought my first herd of cattle and later attended Olds College in their meat processing program, one of two schools left in the world that continues to teach the art of slaughter in addition to meat cutting, curing, and sausage making. 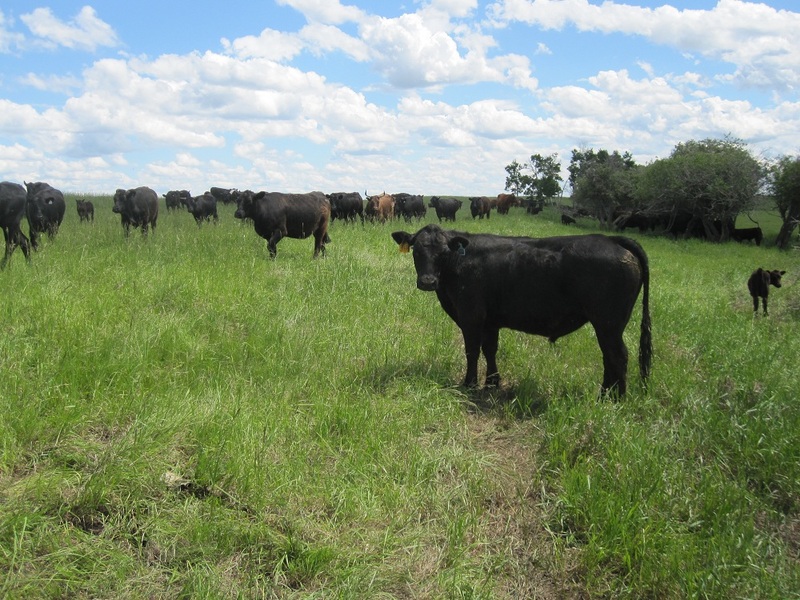 Since returning to the black-soil belt of Central Alberta in 2011 from some formative agricultural years spent in Ontario, I have established a herd share program through which I market seasonally killed, grass-finished beef and pastured pork. Juicy, tender, full-flavoured beef and pork that would make an Albertan rancher 150 years ago drool. People buy the live animals and contract me to tend to them and fatten them in addition to butchering the meat on their behalf. This community supported model has allowed me to kickstart a farming operation as a returning generation farmer with no starting base of land, livestock, or infrastructure. Holistic Management (HM) is a decision making framework that has been instrumental in me establishing a career in agriculture. A holistic goal is set and takes into account a triple bottom line: financial, social, and environmental. When looking at what different enterprises to establish, where to do them, who with, and how best to run them while monitoring for success; HM has given me the framework to do so while fostering meaningful relationships with people, improving the soil and animal health, and making a profit. I farm on exclusively rented land and with many thanks to HM, have been lucky enough over the past couple of years to form some excellent relationships with landowners in order to establish secure land tenancy. 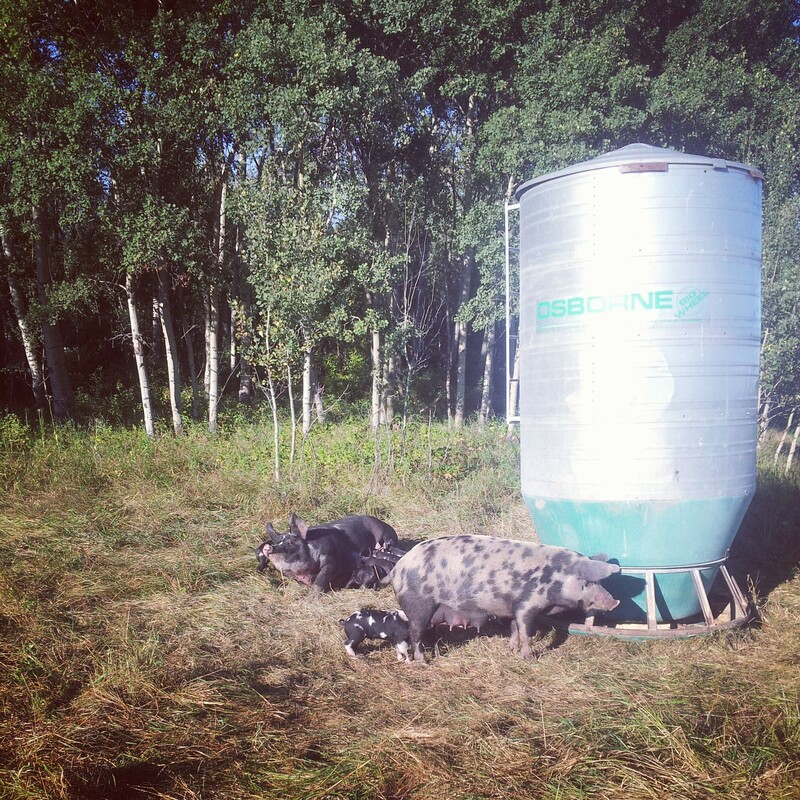 Most notably my wife and I have recently moved to a ranch south of Red Deer. In the 1990’s the ranchers sold all their machinery and sowed everything to grass. In the two decades that have passed they have built top soil and brought native species back into their sward. With no kids to take over the ranch they know that if they sell the farm and retire, the bulldozer will show up to dispose of any re-established trees, followed shortly by the roundup wagon. A couple of bumper cash crops later, their legacy will be undone. 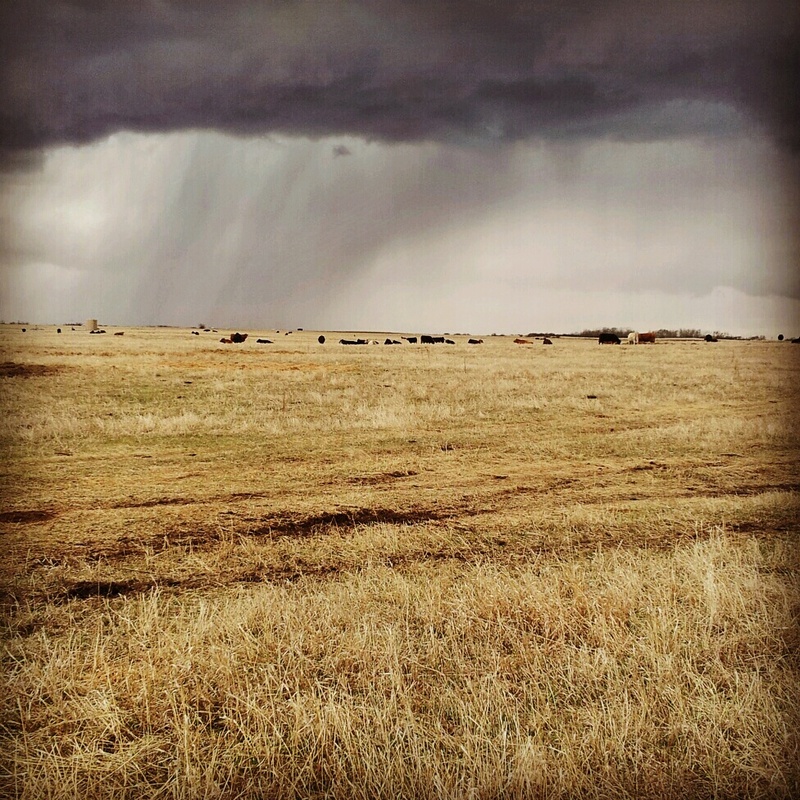 With our involvement in an inter-generational succession plan, the rancher’s need for the land to be stewarded will continue for at least another generation and as new farmers, our need for a secure land base and home is met. One advantage of the direct marketing model is the relationships that are developed with the eaters in town – in my case 100+ families. These urban people care deeply about the food system and are very concerned with many of the same issues that the National Farmers Union concerns itself with. I have been able to leverage my relationship with these families as well as with the NFU to build advocacy around the fight against GMO-alfalfa as well as in the ongoing fight against Bill C-18. It is my belief that by engaging non-farming eaters in the challenges facing Canadian agriculture, our government will be forced once again to enact policy that is aligned with the best interest of food consumers and producers alike. It is also my experience that by engaging with the NFU I am able to provide advocacy as a service to my shareholders, allowing them to take part of the food sovereignty movement in this country. 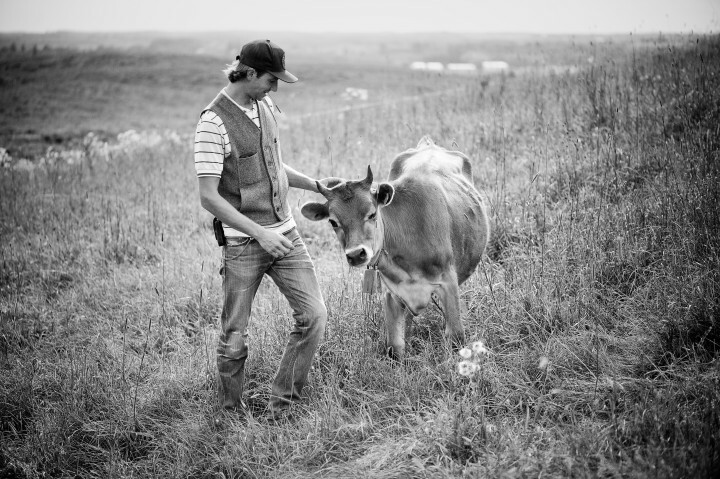 Featured photo (B&W shot of Blake with cow) by Andrea Wiseman. All other photos by Ang & Blake Hall.